1. Students fill out a chart with the forms of ir, and their meaning in English. 2. 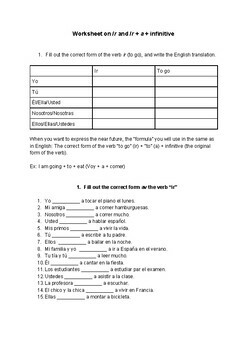 Students use the chart to pick the correct form for 15 fill in the blanks (all the sentences are in the near future tense). About half these sentences require a subject pronoun substitution (clear and concise, easy for the students to understand). 3. 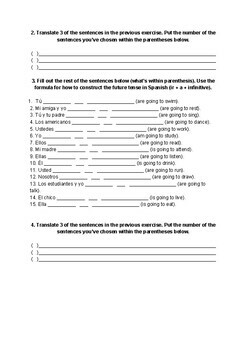 Student choose 3 of the sentences from the second exercise and translate them. 4. Students are provided the subject pronoun (or have to do a subject pronoun substitution) and have to complete the rest of the sentence using the ir + a + infinitive formula. The worksheet has been purposely and carefully constructed so it won't require any prep. I myself used to buy worksheets and then not be able to use them because they contained forms or structures that the students are familiar with, so I construct my worksheets in a way where you are able to just print it, give the instructions. (There are clear instructions and an example as well). Once they've been introduced to "ir" and "ir + a + infinitive", through for example a powerpoint presentation, they should be able to do this worksheet without any hassle or trouble! :) I just gave it to my students today, and they enjoyed it!